Understanding the writing process is a key to writing faster and better. And we all want that! It’s true that mystery cloaks the creative element of putting words on paper. But creativity, I’ve discovered, is rarely conjured up. And if you wait for creativity to strike, you may never complete a project. What happens most often is that creativity “appears” along the way while I’m at the work of writing. So it came as a relief to me to learn that there is a process you can follow to do the “work” of writing. It’s a process that follows practical steps. The steps create a structure and make a big project seem manageable. I can complete one step at a time and then soon, I have completed a project. Breaking down the writing process into a series of steps has been a BIG help to me. This step-by-step approach works for just about any project. And creativity springs up along the way as I take the steps. 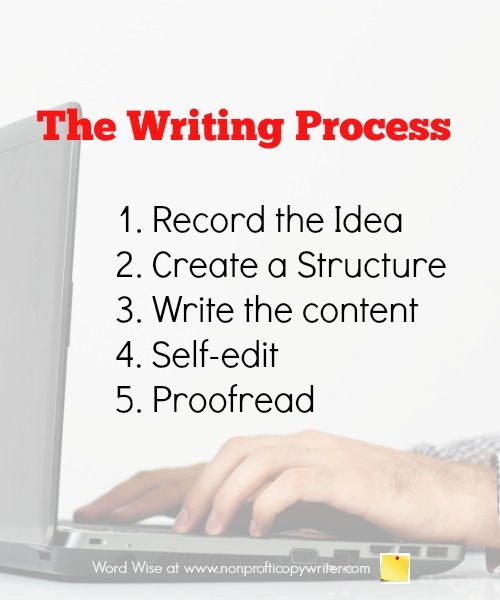 This step-by-step approach is one way to go about the writing process, but it’s not the only way. If this approach works for you, great! If not, go with another method. You have an idea for a project (or you’re assigned one) – a blog post, article, letter, web page, a devotional, even a grant application or a book. How do you get from idea to finished project? The prospect can be completely overwhelming. And it is at this point that you may be tempted, like many writers, to stare at the blinking cursor on the screen with uncertainty or even abject terror. Write down the idea for your project. (Make sure you have a system in place for capturing ideas.) You may need to write down more than one idea and choose one. Write down where your reader will start with the idea. (Let’s call this Point A.) Then leave a large space. Organize your points into the structure you have chosen. Yes, you can call this an outline if you like! Or not. See more details about each of these outline formats. And here are some more tips for getting started with organizing your writing project. Once you choose a structure, fill in the content from your list of points. If the idea of “filling in” the whole piece makes you quake at your keyboard, then work on just one section of the structure – and then another. Do a bit at a time until all the sections are done. Discard ideas that don’t fit in well, but keep them in a separate file to use in another project. Read through your project and rework it so that the content flows well. You now have a rough draft! Good writing is rewriting. Make sure to address two different elements in editing: content and mechanics. Content: critique and refine how you handle your topic. Does the piece move logically from Point A to Point Z? Is the content interesting and engaging? Mechanics: rework and refine your writing so that it is correct, easy to read, and clean. Study and correct the content to make sure there is a mixture of short and long sentences. Edit sentences so they start and end with different words. Look for missing words, repetition, awkward construction, passive voice, subject-verb agreement, misplaced modifiers, incorrect homonyms, verb tenses, and splint infinitives. Run grammar and spelling checks. Leave your project for a time – whether for several hours, days, or a week. Then re-read it carefully. Read it aloud. Read it slowly. You’ll know you’re “done” when your project reads like a “greased slide,” without bumps or tongue twisters, smoothly from beginning to end.